Once February rolls around, it can only mean one thing: fashion week has arrived. But rather, it should be called fashion month since over the course of several weeks runways dominate some of the major fashion capitals of the world. Of course, the first stop of the season is New York City and so far there have already been looks that caught our eyes. From models to influencers, there have been some pretty chic moments full of long coats, contrasting textures, lots of pastel blues, and plenty of bright pops of color. 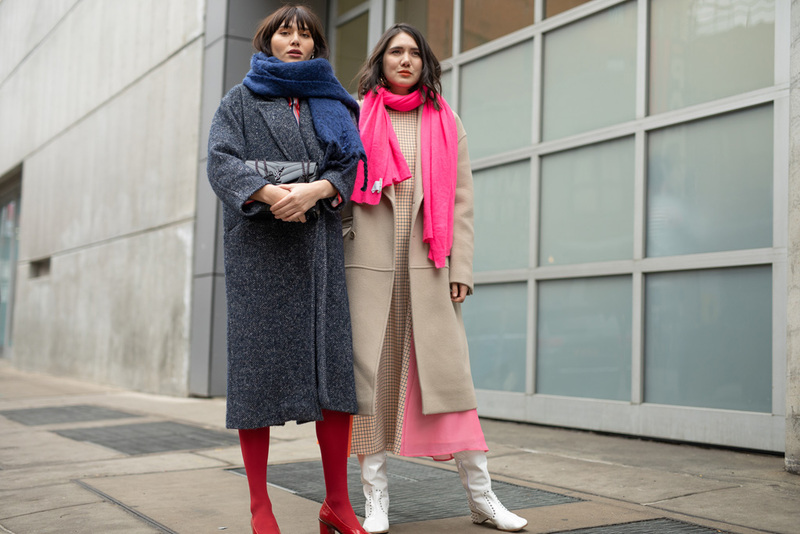 Natalie and Dylana Lim Suarez attended Rachel Comey’s ready-to-wear Fall 2019 show bundled up in long coats and thick scarves. Indeed, heavy coats that fall to the shins have not only been a style staple as of late, but they’ve also been a weather necessity considering the storms of winter 2019. Natalie, a model since her teen years, took off with her fashion blog Natalie Off Duty. With her sister Dylana, who is a talented photographer, they’ve been mainstays in the fashion blogging scene, particularly on Instagram. Many fans flock to their pages for style tips and inspiration. NYFW in February 2019 kicked off with plenty of menswear shows, where this fashion week guest was spotted. 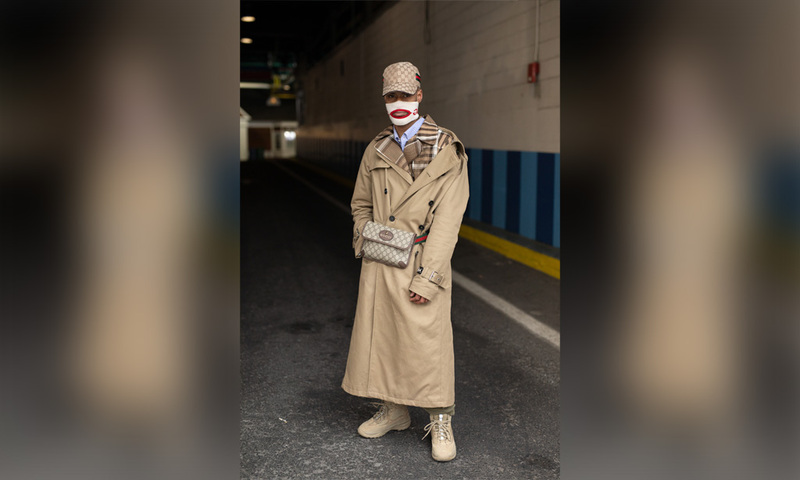 He wears a Gucci hat with a complementary Gucci hip belt bag over his khaki trench coat, and shoes reminiscent of the desert boots seen in Yeezy Season 7. He also sports a GCDS face mask, which we can only assume serves both fashion and function considering the weather. This entire ensemble is just another example of long coats reigning during the winter 2019 season. This guy also wears plaid, which has been seen frequently among menswear street style. 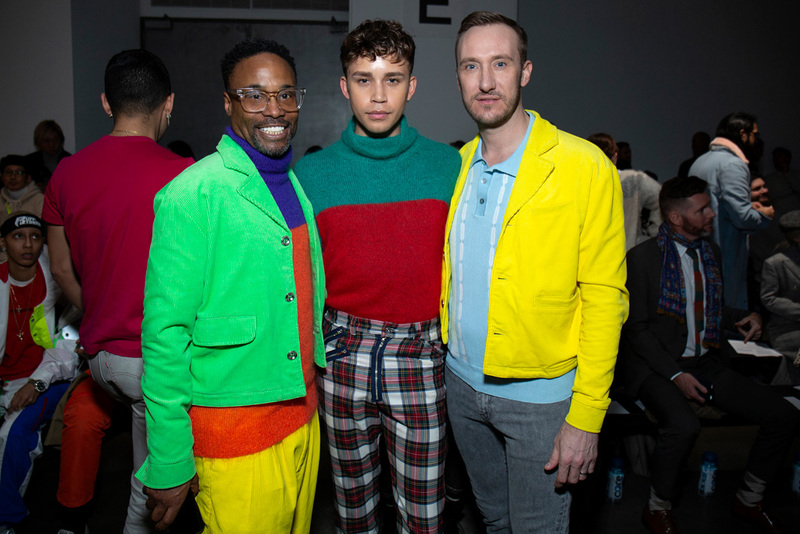 Billy Porter, Jeremy McClain, and Porter’s husband Adam Smith made bright, bold statements at the Landlord Show during New York Fashion Week Men’s at Pier 59. Porter is a NYFW Men’s ambassador and a Tony Award winner who stars alongside McClain in FX’s Pose. McClain was a model who made a breakthrough in his acting career with Pose. Indeed, color blocking with fluorescent shades seems to be a common theme throughout this season. The same can be said for menswear plaid, as you can see McClain sporting plaid pants in this photo. B. Åkerlund showed up to the Rodarte F/W 19 show in “full bloom,” as she put it on Instagram. 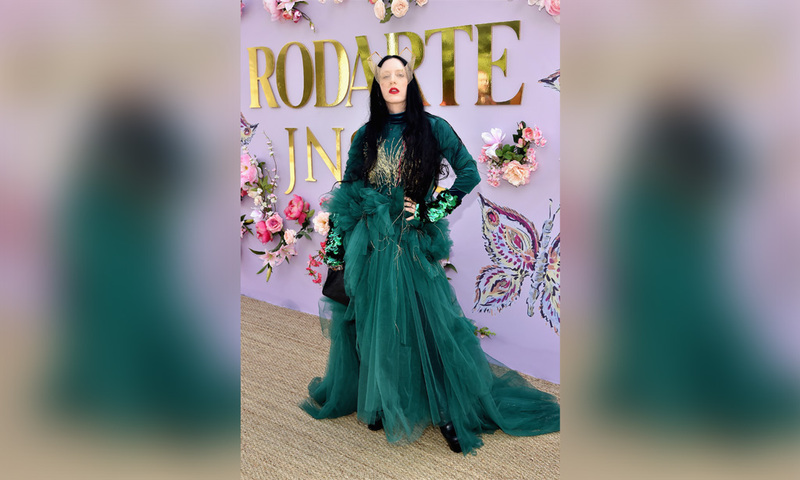 Her exuberant teal green dress was surely one of the most eye-catching pieces worn by Rodarte’s guests and it was certainly a nod to Kate and Laura Mulleavy’s garden aesthetic – complete with puffy sleeves and statement hats – on the runway that day. Åkerlund also sported a pseudo-veil in the form of her gold headpiece. Åkerlund is a “fashion activist” and an incredibly talented costume designer. The stylist has a client list that includes the likes of Madonna, Beyoncé, and Lady Gaga. New York Fashion Week also kicked off with 11 Honoré, a plus-size online retailer whose first go at fashion week was a phenomenal success hallmarked by trans activist and actress Laverne Cox closing the show in a fiery gown by Zac Posen. This show corrected the fashion industry’s oversight of inclusivity, especially in terms of sizing. 11 Honoré sells designer threads from Marc Jacobs, Prabal Gurung, Badgley Mischka, and more – exclusively in sizes 10 to 24. Their revolutionary debut show featured a lineup of models sizes 12 to 20 in an industry where a size six was once considered pushing it. 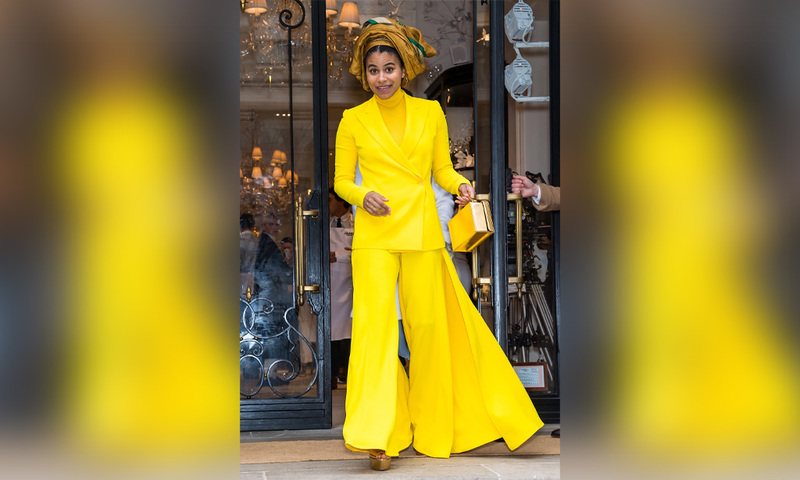 Atlanta actress Zazie Beetz left Ralph Lauren’s Spring/Summer 2019 show in a dazzling yellow two-piece ensemble. The bright yellow hues were certainly welcome on this gloomy February day in New York City. The Ralph Lauren show this year was truly unique as it was held in the designer’s flagship location on Madison Avenue in a replica Ralph’s Coffee Shop. In addition to Beetz, guests such as Anna Wintour, Camilla Belle, and Cynthia Germanotta sipped coffee while the designer showcased his warmer-weather offerings. Bella Hadid and fellow models donned sleek, shimmery evening wear. 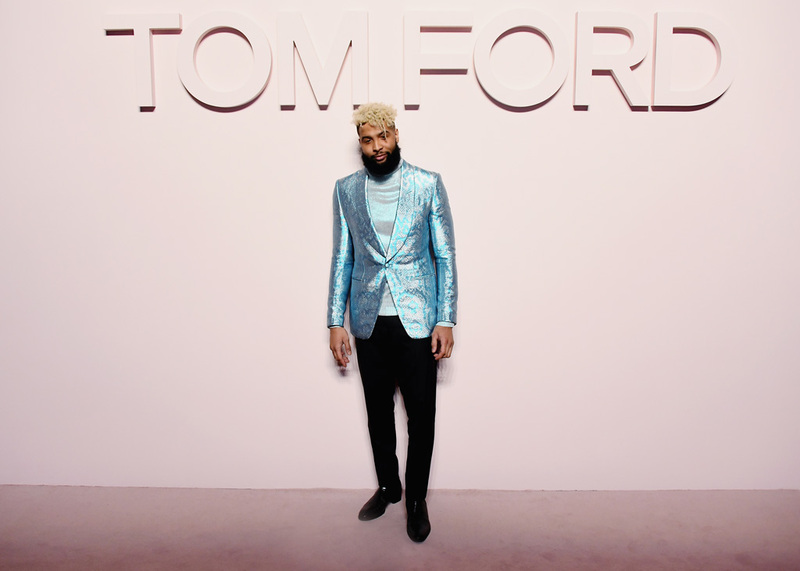 Odell Beckham Jr. pulled up to the Tom Ford F/W 2019 show looking simple, but sleek in a shiny snakeskin-print blue blazer. The New York Giants wide receiver was decked out in head-to-toe Tom Ford, which is not out of character for the taste-making athlete. Indeed, Tom Ford’s fall runway show was prominent with satin, leather, and velvet suits in black, grey, and rich tones of eggplant, brown, and red. In reference to one of the looks from that night, Beckham told New York Post, "I need that red velvet suit, I love red velvet cake." Fashion bloggers Courtney Trop, twins Reese and Molly Blutstein, and a friend dressed head-to-toe in Collina Strada outfits for designer Hillary Taymour’s Fall 2019 show. Influencers are becoming staples among many fashion week guest lists, so it’s no surprise that those as authentic as Trop and the Blutsteins were invited. Taymour had environmental activist Xiuhtezcatl Martinez speak about protecting life and the planet as models traversed the runway in sustainable clothing, much of which was made with reused materials. The outfits seen in this photo appear to be accessible versions of what Taymour presented that day. 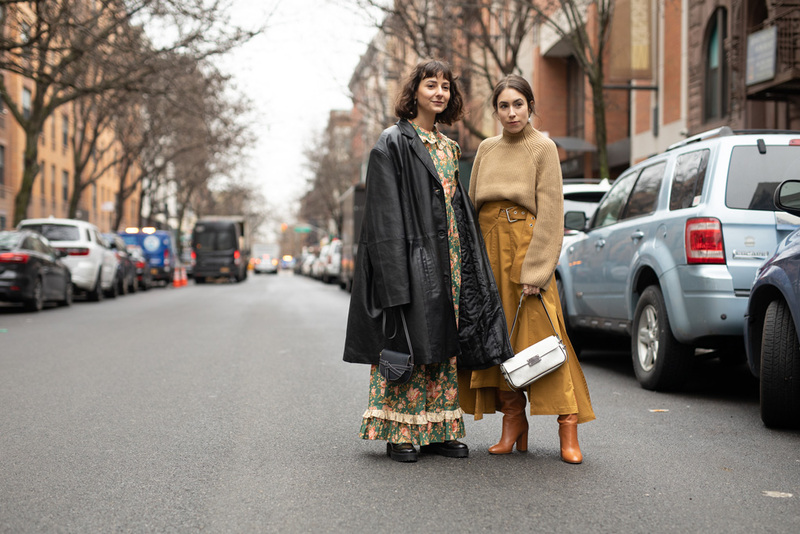 These fashion week guests were spotted outside Tadashi Shoji’s Fall 2019 show. The woman in the pink coat is evidence that wide-legged pants are still here to stay, while the woman in the white fur coat only exemplifies how much the fuzzy texture is taking over many people’s closets. Tadashi Shoji has said that the inspiration behind his Fall show was Southeast Asia, where he had spent a lot of time, citing that fans of Crazy Rich Asians might enjoy this particular collection. Indeed, his runway that day was wrought with incredible evening gowns with velvet, tulle, and sequins. Spanish model Gala Gonzalez posed with bloggers Charlotte Groeneveld and Xenia Adonts outside of the Ralph Lauren show. Groeneveld clearly stands out here in head-to-toe baby blue, save for her yellow sneakers. She wears a flowy, sheer skit and a very comfotable-looking hoodie. Meanwhile, Gonzalez and Adonts exude military-esque vibes, opting for the timeless color, black. Based on both of their outfits it’s clear that leather is not just for purses. Leather has been seen on the runway and the streets as coats, pants, jackets, skirts, and even full-length dresses! That’s right, a full-length leather dress. See one coming up! A model clearly had her game face on as her dress was adjusted before the start of the threeASFOUR show. She wears a bright spandex body suit underneath an abstract piece, as do the models behind her. Lisa Aiken was spotted outside of the Collina Strada show rocking warm brown tones with a teddy jacket and a full-length leather dress. Aiken is dressed to the nines in many common themes we’ve seen for NYFW street style so far: furs, leather, and neutral tones. Aiken is causing buzz in the fashion industry as the new women’s fashion director at Moda Operandi, a fashion discovery platform that allows consumers to shop directly from the runway. For Aiken, it helped that she was already known within the industry for her killer street style. This fashion week guest was seen leaving Tadashi Shoji’s Fall 2019 show. Her subtle denim-on-denim look is complemented by a long checkered coat that separates her jacket from her jeans. Clearly, the dad cap trend is still around, but she at least incorporated a nice pop of color with her red scarf. While many notable fashion week guests are dressed by the designers of shows they’re invited to, the real people to look out for are those who obviously dress themselves. These people truly have an eye for fashion. Sometimes, the real show is on the sidewalk. 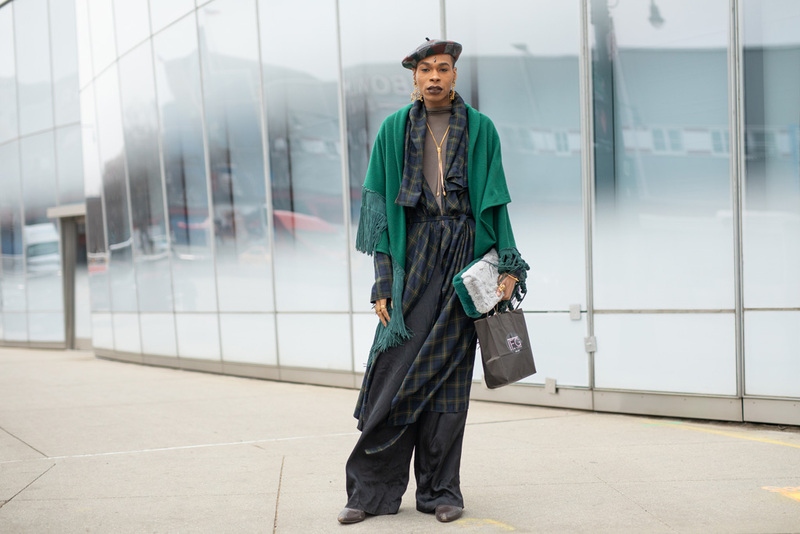 B. Hawk Snipes was seen on the streets during NYFW wearing a green wool scarf over a navy plaid number that gave his six-foot-three stature a lovely billowing silhouette that many fashion mavens are sporting these days. His accessories are on point, with a gold necklace and earrings and a coordinating plaid beret. Snipes is an androgynous model who has been featured on FX’s Pose. It’s no question that since rising onto the popular consciousness, Snipes has been cited as a style icon among many others within the fashion industry. 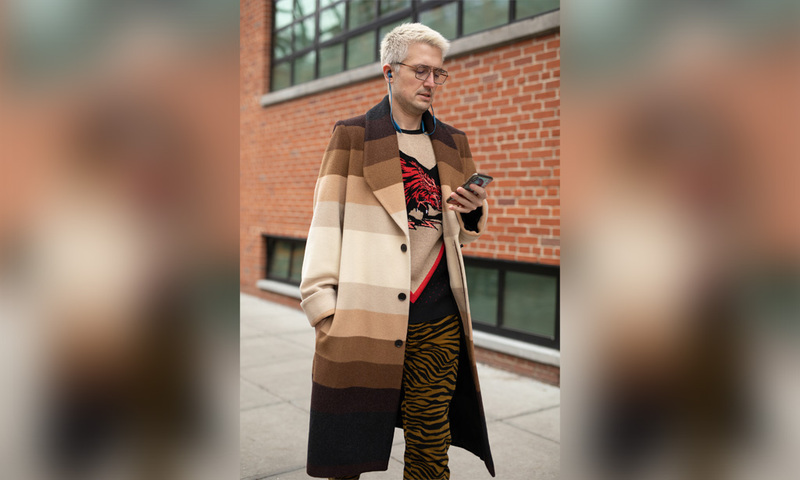 The neutral color palette played a huge role in New York Fashion Week street style in February 2019. Plenty of fashion week goers were dressed head-to-toe in tones of camel, sand, and beige, but here is one guy who decided to go with all the brown tones under the sun! Like others, he wears a coat all the way past his knees. He also sports tiger-print pants with a tiger on his sweater. If that doesn’t say fierce, we don’t know what does. Animal prints have also been seen on plenty of outfits throughout this season. Coscarelli is a fashion writer and consultant who said of her floral frock, “I remember being so mad I couldn’t wear a skirt shorter than knee-length in middle school, now you can hardly find us in one above the ankles.” This is so true of many looks we’ve seen this year! 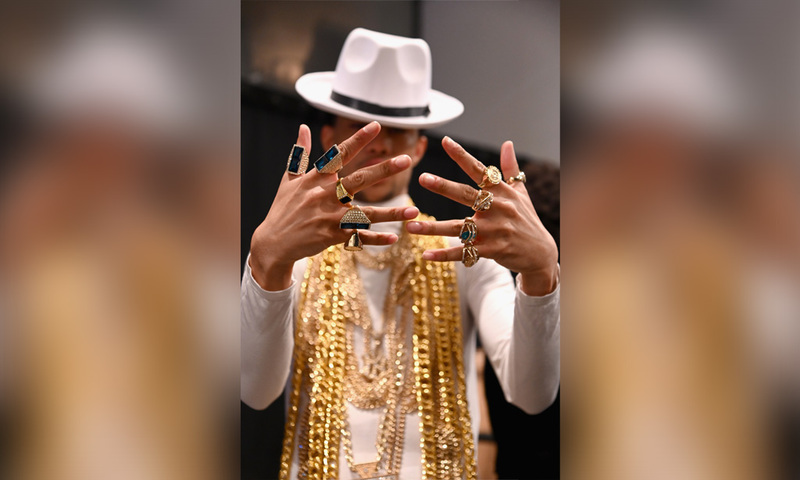 This model was bling-ed out backstage at the Harlem’s Fashion Row Special Event at the beginning of NYFW. This only goes to show that great, bold accessories will never go out of style. For this particular event, Harlem’s Fashion Row teamed up with fashion-industry heavyweight IMG to celebrate Ruth E. Carter. Carter, of course, is the legendary costume designer behind films such as Black Panther, Selma, and Malcolm X. Many of her designs were on display at Spring Studios to celebrate her work. 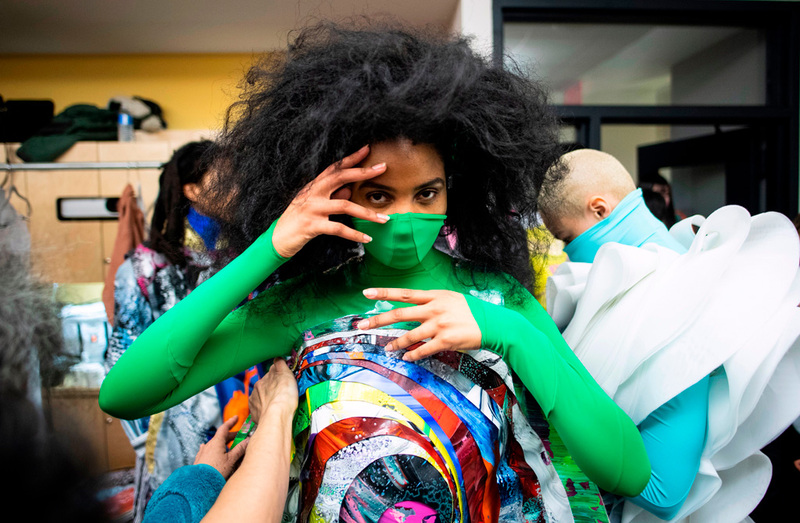 Harlem’s Fashion Row provides exposure for designers of color within the fashion industry. In any niche, it’s great to start kids out young if you want them to succeed! This mom and her daughter were spotted on the streets during NYFW looking oh-so-chic in jewel tones. Mom wears a long, golden yellow coat with high-waisted camel-toned trousers. We wonder if she dressed her baby girl herself, but we’d be more impressed to know that the young lady had a say in what she wore that day. She wears a pink jumpsuit under a striking (in a good way) tiger print coat. We can only imagine how stylish this girl will be when she’s older! Sophia Macks, founder and CEO of Beyond The Mag, was spotted on the streets during fashion week, clearly already on board with Tom Ford and the suit trend. Here she wears a baby pink blazer with half-length sleeve and coordinating flowy trousers. Her business gets a little groovy with her tie-dye shirt underneath and over-sized square sunglasses. She topped off the look with a pastel blue purse. This eye-catching look is nothing short of what’s expected for a hard-working woman who redefined the way we consume culture and fashion at once. 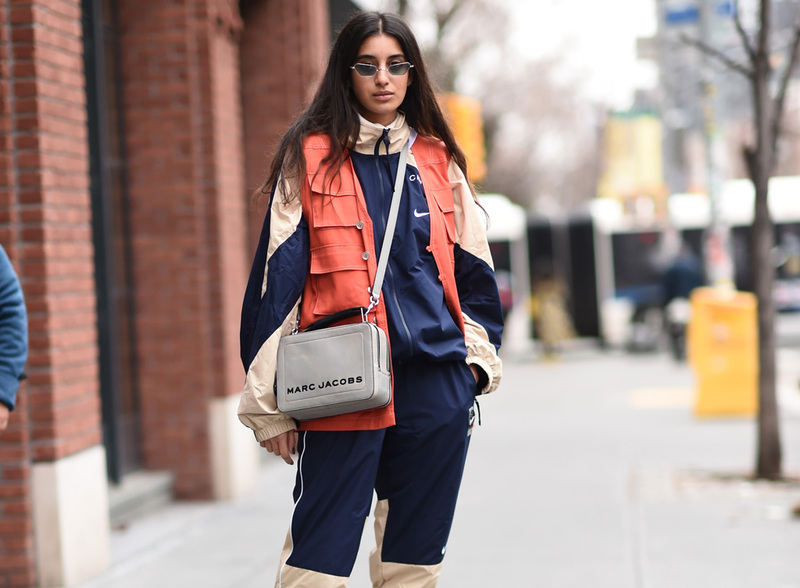 This fashion week guest wears a Nike tracksuit set underneath an orange-red vest outside of the Collina Strada show during NYFW. Her Marc Jacobs bag is a nice neutral pop to an outfit where the colors can already speak for themselves. In a nod to the ’90s, her thin sunnies give the look an overall futuristic vibe. Among many of the street style looks to grace the sidewalks of New York City during fashion week, this one certainly doesn’t sacrifice style for the sake of comfort and it’d be one that we’d be willing to rock any day.